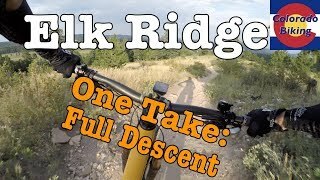 This ride is around 11 miles total with just over 2000ft of uphill and fun downhill. 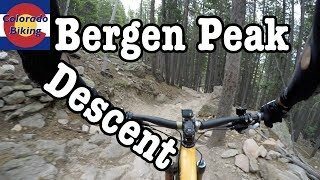 This is one of the best routes to get to the top of Bergen Peak and back, using the most fun & technical sections of trail to get to the top and the longest way down. This route avoids the easier and wide Founders and Painters Pause trails, and instead uses better singletrack for the last section. 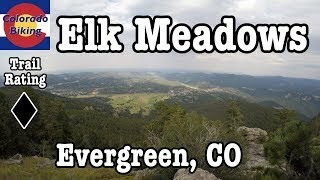 It's best to ride this area during the week as Elk Meadow gets very busy during the weekend when the weather is nice, or start early to avoid crowds, especially on the downhills. This ride is for people that like technical trail with rocks, roots, waterbars, etc. It gets pretty icy after snow gets packed down in the winter, best in the Spring and Fall. A good full suspension mountain bike with a dropper seat-post is nice to have for this more technical ride. The last section to the top of Bergen Peak is out and back. There are quite a few blind turns on the way down, be aware of other users that you might encounter. There are 2 official parking lots at Elk Meadow, park in the lower lot to finish with a downhill. Ride up the Sleepy "S" Trail all the way up. Turn right at the T junction, onto the Meadow View Trail. (left goes to the upper parking lot). Then, turn sharp left onto the Bergen Peak Trail, this is where the ride becomes much harder. It's like a puzzle of technical features, one after the other while climbing; rocks, roots, waterbar turns, etc. There will be failed attempts to clear some of these, some dismounts and walking, etc. This section continues all the way to a T junction, where a left turn is the out & back to the top of Bergen Peak. Take a left and go to the top - there is more technical stuff up there but it's worth it. There are a few aspen groves, which look great during the fall season, and good views at the top. Take a break and enjoy the moment. Commence with the best part of this ride: an almost continuous downhill all the way back to the parking lot. There are only a few short uphill sections and lots of technical downhill. This is where a dropper seat-post comes in really handy. Again, this technical trail, not for everyone. Start back down the 'out & back' portion of the Bergen Peak trail, but take a left (almost straight) onto Too Long trail. After a short rise, there will be a long downhill section with lots of fun features that will last for miles. This will finally meet up again with the Meadow Trail, turn right (a left turn leads to the easy/wide way back to the parking lot - not as good). There will be some short uphill sections on the Meadow Trail. At the next intersection, turn left onto the Elk Ridge Trail. This short section is fun on the way down with rocks & waterbars to hop off. This leads back to the Sleep "S" trail. Turn left to coast back to the parking lot. Difficult, technical climb; very fast and fun descent! At the top of Bergen Peak. A view of Elk Meadow. Technical section on Too Long Trail.